Lending a big Halloween saving, SketchThemes is offering a mega discount of 40% all SketchThemes clean, creative, responsive and multipurpose Wordpress themes. Use this coupon code and enjoy the sale. Gabfire offer you a treat for Halloween 2015. 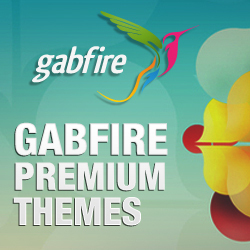 You will get any Wordpress themes from Gabfire with 35% off by using this coupon code. The sale will end on Monday, November 2. Hurry up and get it now. Another Great Halloween coupon code from the popular Joomla provider: Theme Junkie. Use this Theme Junkier coupon code, you can get 50% off on any purchase, valid for new and existing customers (renewals+upgrade). Check now! Check it now Mythemeshop fan. This Mythemeshop coupon code can help you to purchase membership plan with only $60 and the extended membership only $150. Save 15% off from your purchase on Wordpress themes and almost 26% on Wordpress plugins. Another responsive Wordpress theme is out at SketchThemes. Use this Sketchthemes coupon code at checkout page to enjoy 20% discount on PurplePlay Business WordPress Theme. Over 100 Premium WordPress Themes and Plugins at Wpeka is waiiting for you. Use this coupon code you will get 40% discount on any WPeka Club Membership Plans. This offer is valid till - 31st August 2015. Don't waste your time and your money. Check it now. Will expire on August 16 so take your chance now. Buy any Wordpress theme at Sketchthemes, you will receive another WP theme + WP plugin for FREE. So amazing, right. Go shopping now. 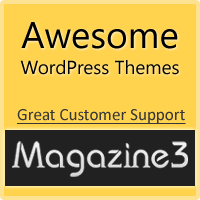 Want to purchase any Wordpress theme at Magazine3. This Magazine3 coupon code is for you, with 25% discount. Use it before 20th July 2015 and enjoy the discount. WPeka Club is home to over 100 Premium WordPress Themes and Plugins. A new plugin is added every week and all WPeka Club Members get access to all new products and updates. Use this coupon code and enjoy 20% off on all WPeka Club Membership Plans. You can't have a better Frogstheme coupon code out there. Grab it and enjoy 50% discount on your purchase. It's really the best time to get Frogstheme wordpress themes and plans. Use this code TODAY. What are you wondering now?